The human rights at risk of the most severe negative impact through the company’s activities and business relationships. The UN Guiding Principles Reporting Framework asks companies to focus their human rights reporting on their ‘salient human rights issues’. To learn more, see our short Q&A below, or view our introductory video. For further explanation of additional key terms used in the UNGP Reporting Framework, please see the glossary. UNGP Reporting Framework: Salient Human Rights Issues from UNGP Reporting on Vimeo. 1. What are salient human rights issues? Something that is salient is prominent or important. It stands out conspicuously. A company’s salient human rights issues are those human rights that stand out because they are at risk of the most severe negative impact through the company’s activities or business relationships. This concept of salience uses the lens of risk to people, not the business, as the starting point, while recognizing that where risks to people’s human rights are greatest, there is strong convergence with risk to the business. Most severe: based on how grave and how widespread the impact would be and how hard it would be to put right the resulting harm. Impacts on human rights: placing the focus on risk to people, rather than on risk to the business. Salience therefore focuses the company’s resources on finding information that is necessary for its own ability to manage risks to human rights, and related risks to the business. In this way, it helps companies report on the human rights information that shareholders, investors, governments, customers, consumers, media, civil society organizations and directly affected people want to see. 2. What is the difference from materiality? Assumption that past impact defines future risk: An assumption that looking at past impacts will be sufficient for the identification of forward-looking risks to human rights, ignoring risks that might be identifiable from the experience of others in the industry, from other industries, from an understanding of emerging issues and from scenario planning. Skewed feedback: Processes that engage with stakeholders based on their expertise in areas the company already assumes are material, such that their feedback reinforces the company’s starting assumptions. Under-informed feedback: Engagement processes where stakeholders are not given sufficient insight into the company’s operations, range of business activities and business relationships in order to provide informed advice of where they most salient issues might lie. As a result of these common assumptions and pitfalls, many companies’ existing materiality processes fail to adequately reflect human rights issues or to identify those human rights that are at greatest risk and are therefore priorities for management and reporting. 3. Why is this distinction between salience and materiality helpful for companies? Identifying salient human rights issues is critical for any company seeking to understand how the most severe kinds of harm to people might be associated with its activities and business relationships. It is the first stage of human rights due diligence and a vital internal process that gets companies out in front of risks and enables them to address them proactively. Salient issues are therefore not only the issues on which companies should focus their reporting, but also the priority human rights issues for risk management. Using ‘salience’ means that reporting changes from being a resource drain on companies – an exercise in chasing down data for an external communications exercise – to being an investment in putting in place processes that enable the company to manage key risks to people and to the business. 4. Why is this distinction between salience and materiality helpful for investors? Materiality processes very often miss significant risks to human rights. Investors can have many interests, but one that unites them is the desire to know that risks are being managed. If a company is not conducting proper human rights due diligence, there may be risks of severe impacts on human rights, and therefore related risks to the business, that are going unrecognized and unaddressed. This explains that examples of severe human rights impacts that we see in the public domain and there were not previously anticipated or managed by the companies involved. A company that can articulate its salient human rights issues and how it identified them can show to investors and other stakeholders that it is doing human rights due diligence and identifying issues that need active management. That should be a minimum expectation of any investor. Where the company finds risks of severe impacts on human rights, the investor should then expect to have information about how those are being managed. The UNGP Reporting Framework provides the targeted questions for companies to do so. For more about investor support for the UNGP Reporting Framework, see the investor coalition statement of support. 5. Are risks to human rights separate from risks to business? Human rights impacts are the most acute social, environmental and economic impacts a company can have on people. Salient human rights issues are in turn the most severe human rights impacts. Impacts that carry this level of severity can be seen to converge strongly with risk to the business, as demonstrated in the many instances where they lead to litigation, reputation-damaging campaigns, disruption and delays to operations, increased costs of managing conflict and other costs or loss in value to the business. This is particularly evident over the medium to long term. 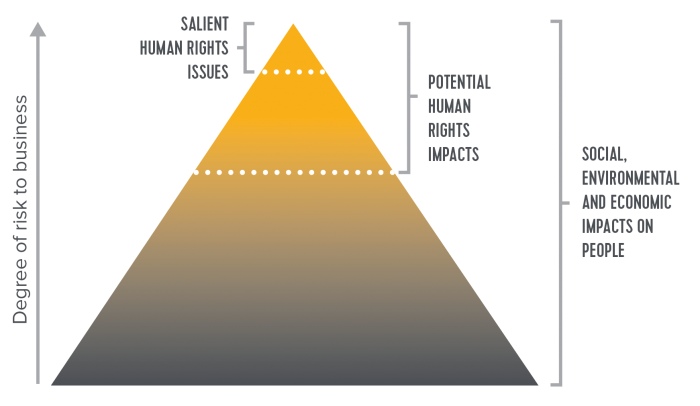 The relationship between salient human rights issues and risk to business is represented in the figure below. 6. Is materiality still relevant for reporting? Yes – materiality will remain relevant for both broader sustainability and financial reporting. In essence, materiality refers to what is really important or has great consequences, and the various definitions of materiality take differing views on that question. An understanding of how human rights are important in relation to the conduct and success of business has been missing, however, leaving companies and investors exposed to the flawed assumptions and pitfalls outlined above. Salience addresses this gap. Companies can apply the concept of salience within a broader materiality exercise, using salience to identify the necessary human rights content of its reporting. For instance, companies using the Global Reporting Initiative’s G4 materiality process for their broader sustainability reporting can use salience and the questions in the UNGP Reporting Framework as they determine what to disclose specifically on human rights, supported by relevant GRI indicators. When using definitions of materiality that focus on risks to the business that carry a certain level of financial value, salience will still enable the company to identify those human rights issues most likely to pose material risks to the company given the strong convergence between the most severe potential impacts on human rights and risk to the business. The UN Guiding Principles Reporting Framework makes clear that if the specific materiality definition being used sets a threshold that excludes certain salient human rights issues from a report, the company can disclose them elsewhere and refer to where that additional information can be found. This approach mirrors the guidance provided by the Integrated Reporting Framework. By using the Index of Answers for the UN Guiding Principles Reporting Framework, companies can show in one coherent, concise format where readers can find their responses to the Framework’s questions across different locations. 7. How should a company identify its salient human rights issues? If the number of salient issues initially identified is too large for the company to report on concisely, it may use the defining elements of ‘severity’ set out above to reduce the number further, for example, by focusing on those impacts that are most widespread. Any process to identify salient human rights issues should take into account the perspectives of those stakeholders who may be negatively impacted or with their legitimate representatives. In addition, expert stakeholders – shareholders, NGOs and others – are a key audience with which the company should check its conclusions to see whether any considerations have been missed or potentially salient issues overlooked. Where companies already build in engagement with stakeholders as part of their process to identify material issues, they can use those same conversations to explain their findings about salient human rights issues and how they were identified and to test their conclusions. Further key considerations when identifying a company’s salient human rights issues are set out in the implementation guidance to section B1 of the UNGP Reporting Framework.